ROTHENBURGER – Will newest, grandest public art project get two thumbs up from the masses? Parkade art as envisioned by Bill Frymire. GOOD ON the City for its newest public art project. I’m a huge fan of public art. This week, councillors were shown plans for putting lipstick on the Lansdowne Street parkade and they were full of praise for what they saw. “Really striking,” said Arjun Singh. “Really great,” said Donovan Cavers. “I love this,” said Tina Lange. It’s not easy making a parkade look good but this new concept — a $166,000 one, plus a whole bunch more for other pieces of the façade upgrade — passes the test. My test, anyway. The idea is that the parkade will be cleaned and painted, and “architectural mesh” attached to the three walls visible from Lansdowne Street. Kamloops artist Bill Frymire and a crew will attach steel tiles to the mesh to create a mural representing the meeting of the waters. The tiles in the river will move and sparkle. Like water, sort of. The theme is anything but new, but the artistic methodology is a great idea for the parkade. I first heard of Frymire almost four years ago when an Armchair Mayor reader noticed that someone had used pieces of plastic milk cartons to weave a likeness of Terry Fox into the chain link fence at the Kamloops tennis club. After some sleuthing, I traced it to Frymire. Some might say parkades are supposed to be ugly, so leave them alone and save the money. But if their aesthetic disadvantages are their starkness and their size, this also creates a big canvass for somebody like Frymire. Public art doesn’t come easy, as Kamloops has discovered. Flak jackets are standard issue for artists and selection committees, and it’s easy to make bad choices — just take a look at that giant carbuncle called Rivers at the roundabout in front of the Sandman Centre, or the big slice of cheese called Freud’s Ceiling at the TCC. Keep in mind that when I say I’m a huge fan of public art, I mean I’m a huge fan of public art that I like. Public art is full of trip hazards — in at least one case, literally. A fountain-and-rock thing in the plaza at the arena had to be removed after somebody fell into it and hurt themselves. The Gaglardi statue, the Wildfire Memorial at the Civic building, the Art Symposium pieces in Riverside Park, that rusty thing I still don’t know what to call at the corner of Second and Victoria — all of them encountered detractors. The Overlanders statue at City Hall might be an exception. A second wildfire memorial monument approved a few weeks ago ran into public objections from the start. I may even have been the first objector to go on record, pointing out the original wildfire memorial statues from 2003 were entirely funded with donations. This new one is well-intended but it was hatched by bureaucrats behind closed doors with insufficient thought. Aside from the $100,000 tax bill, a lot of people just don’t feel another wildfire monument is needed. But there are other potential hazards, too. Many years ago an artist was paid to paint a mural in the stairwell at the museum, and when somebody wanted to paint it over, it was discovered that it’s not so easy — artists have rights, and their art can’t just be erased. Kind of like surface rights in an artists’ version of the mining act. Could the same happen at the parkade if the City ever decides it wants to change it, or tear down the parkade? Or if it just gets worn out? It’s not as silly as it sounds. If you look at the back wall of the Memorial Arena, you’ll see a giant graffiti-art eyesore, the brainstorm of the late City councillor Dave Gracey, rest his soul. Gracey thought it would be a way of combatting the graffiti problem. Today, it’s a faded blemish that would be greatly improved with a solid coat of beige exterior latex. Cavers asked about the expected longevity of the metal mural planned for the parkade. City arts manager Barb Berger assured him it will have a good, long, life expectancy. But Lange raised another issue of practicality. What if something is built on the lot to the west of the parkade? It would render that side of the mural invisible. Berger’s creative answer is if that happens, maybe the tiles could be moved around to the front and fill in gaps on the street side. Hmmm. I’d say the City would be well advised to have its lawyers draw up a very tight prenup. There remains another shoe to drop, though. It’s called the Seymour Street parkade. Another $160,000? Could be a very interesting year, public art-wise. My only request is, please, no cheese on that. 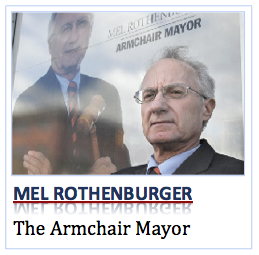 8 Comments on ROTHENBURGER – Will newest, grandest public art project get two thumbs up from the masses? Pierre, I would like to think that the artist Frymire (who is a life long Kamloops resident) has the expertise to engineer the materials and installation for it to not deteriorate. I just hope the metal doesn’t get ripped off like the metal used for plaques on our other monuments/sculptures. This is a huge investment of Frymire’s energy and probably one of his most ambitious projects to date so he would want to get it right. While I do not think an explanation is required, the artist’s name should be present in some way. Yes the artist name should be front and center not council nor major nor any other bureaucrat, in my opinion. However, the cost of the project including installation is too cheap, again in my opinion. You could’t have it painted properly for that kind of money. And the more I think about your article Mr.R. and the proposed art installation, the more I think it to be a boondoggle even just from a location point of view. Because regarding “point of views” there are none from which to enjoy the proposed art work. Even from Lansdowne Street…which is a thoroughfare not a promenade-fare. It can be easily argued relatively few “art form benefits” will be realized from this project. There are many, better suited locations which would provide greater benefits to a greater number of people for public art “to be”. Sure, but keep in mind sprucing up the parkade is part of a larger upgrade to Lansdowne. Lansdowne Street was dramatically upgraded a few years back. It is over the top in my opinion if there are plans to upgrade it even more. You must realize how much money is involved in building/rebuilding/upgrading roads and to continue down that mind-boggling path over and over. And please don’t get me started on roads, because you did. As of late, every catch basin is plugged solid with snow and ice. As the snow melts it forms puddles and the melt water can’t go anywhere except through cracks in the asphalt and at the concrete curb/asphalt interface. Then, when the temperature drops below freezing at night said water freezes causing further cracking. It only takes a few days to completely undermine a section of road. Those roads sure are a good make-work project…except it costs a huge bundle of money. I know I have digressed but I can’t let any chances to slip by to highlight something I consider almost absurd. Public art is great – let’s give it a try. And let’s get working on a Performing Arts Centre again. Even little Vernon has a great centre. Sagebrush Theatre is worn and inadequate. $ 160,000 would not buy a quality paint job, any color, on such large building. Leave along a metal tile installation. It will rust and the retrofits will be costly and it will be torn down perhaps after Ms. Berger’s retirement. We still are dealing with some of Mr. Diehl poor decisions (hence costly) are we not? Do we want more problems for posterity to deal with? Don’t get me wrong, public art is great and I wish it was totally intertwined with the DNA of our city. Art can be simple items, like a better choice of color, like powder-coated metal benches rather than the cheap crap used at the bus stops. Although we recently find out the cheap crap has been so offensive and impractical to so many even City’s Hall has finally recognized their previous mistake and started a replacement program. So much can be done for little extra at the concept stage, so much can be done if you consider art together with engineering and energy efficiency. But let’s remain hopeful the plaque suggested by Mr. Singh will not be anywhere to be seen…because an artful city should not need an explanation. The elements and time make outdoor art engaging on many levels. Thank you for illuminating some of them. I can’t wait to see it.